This source code is pure old Java, with a lot of boilerplate and very unsafe (missing generics, for each). For historical purpose only. This is typical old Java 1.4 source code using Apache Commons-Lang. There is less boilerplate, but it’s still very unsafe (missing generics, for each). 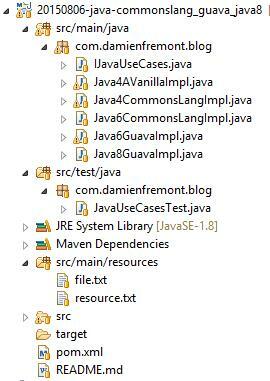 This is lazy old Java 1.6 source code, still using outdated Commons-lang instead of more modern library like Spring or Guava. Not very different, but saffer (generics, foreach). This is actual Java 1.6 source code. Using modern library like Guava. This version is practilly bug-free and comprehensive because of the removing of boilerplate (using guava API and Impl instead). 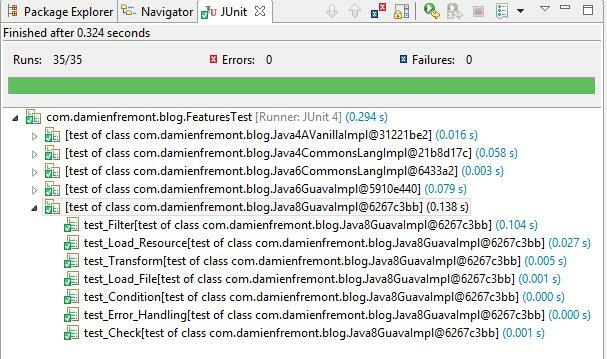 This is actual “state of the art” Java 8. Using new Java API instead of Guava. The source code is a lot smaller, comprehensive, and faster because of the implementation delegation. Good functions like check() and isBlanck() are still missing. Maybe relying on JavaEE with BeanValidation annotation like @NotNull, @NotEmpty. There is no going back, for the purpose of quality and productivity. The only reason not to use this last source code is if Java8 is not allowed on your project. Same for Java6 with Guava, or Java4 with Commons-Lang. On the opposite, vanilla Java 1.4 or Java 1.6 with Commons-Lang are no longer relevant.